DIE Sabbati, 19 die Januarii. Skynner recommended from the King. Witnesses to attend about it. Hodie 2a vice lecta est Billa, "An Act for settling an Estate in Trust, for the Benefit of Mrs. Elizabeth Pride and her Children." ORDERED, by the Lords Spiritual and Temporal in Parliament assembled, That William Ryley Esquire is hereby required to attend this House on Monday the One and Twentieth Day of January Instant, bringing with him such Books, Writings, Escripts, and Papers, in his Custody, as may tend to prove the Matter in Difference between George Duke of Bucks and John Earl of Rutland, concerning the Title of Lord Rosse. 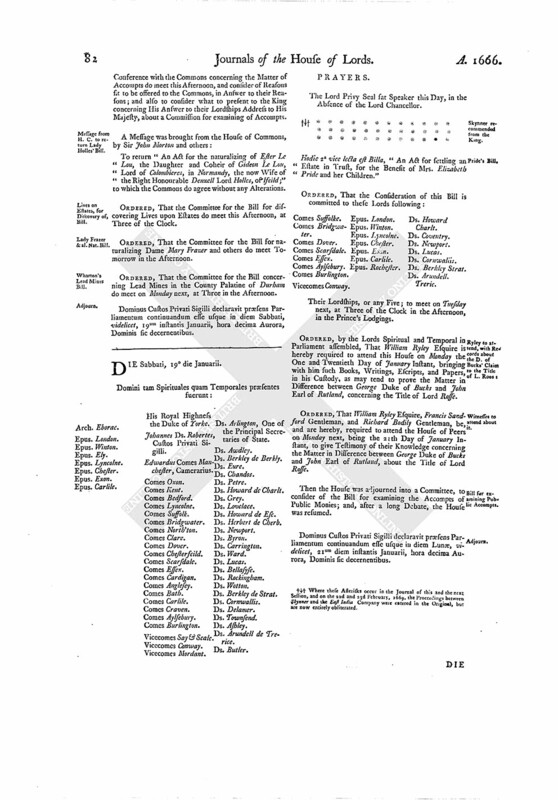 ORDERED, That William Ryley Esquire, Francis Sandford Gentleman, and Richard Bodily Gentleman, be, and are hereby, required to attend the House of Peers on Monday next, being the 21th Day of January Instant, to give Testimony of their Knowledge concerning the Matter in Difference between George Duke of Bucks and John Earl of Rutland, about the Title of Lord Rosse. Then the House was adjourned into a Committee, to consider of the Bill for examining the Accompts of Public Monies; and, after a long Debate, the House was resumed. Dominus Custos Privati Sigilli declaravit præsens Parliamentum continuandum esse usque in diem Lunæ, videlicet, 21um diem instantis Januarii, hora decima Aurora, Dominis sic decernentibus. 1. Where these Asterisks occur in the Journal of this and the next Session, and on the 22d and 23d February, 1669, the Proceedings between Skynner and the East India Company were entered in the Original, but are now entirely obliterated.